The states of Telangana and Andhra Pradesh are replete with loads of Buddhist temples offering the spiritual tourists a unique sense of tranquillity and spirituality. These temples belong to ancient times and boast high significance as well. For this reason, these temples are swarmed by the tourists all-round the year. The magnificent architecture of these temples add feather to the hat. This 06 Nights and 07 Days of itinerary take the travellers to a Buddhist Tour of Andhra Pradesh and Telangana. Major destinations covered in the itinerary are Hyderabad, Warangal, Nagarjunkonda, Vijayawada, Amravati, and Vishakhapatnam. Some of the major highlights of the trip are enjoying sightseeing tour in Hyderabad, exploring temples and forts in Warangal, traversing through the wonderful cities Amravati and Vijayawada, and enjoying laze around on the sandy beaches in Vishakhapatnam. This tour perfectly blends a nature tour and spiritual excursion. On arrival at Hyderabad railway station/airport, meet our representative who will be there for your warm welcome and thereafter to transfer you to your already booked hotel in the city. 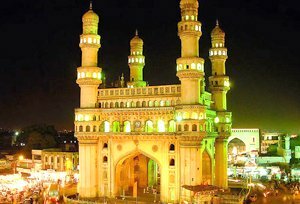 Check in at the hotel and get ready for the local sightseeing tour of Hyderabad. In our day tour, we will be visiting the Golconda Fort. 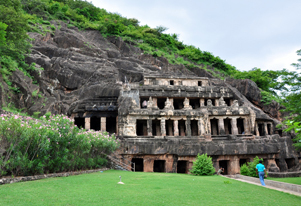 Situated in the western part of Hyderabad city, this hilltop fort is listed among one of the major tourist attractions. It was originally known as Mankal. After exploring the fort, we will return back to the hotel for a comfortable overnight stay. After breakfast in the morning, we will leave for a day tour to Nagarjunkonda, popular for its Buddhist temple remains and museum. It is a famous historical Buddhist town now an island nested near Nagarjuna Sagar in Guntur district in Andhra Pradesh state in India. Later, we will return back in Hyderabad for a relaxing overnight stay. In the morning after breakfast, we will check out from the hotel and drive to Warangal. On reaching, check in at the already booked hotel and rest for some time. 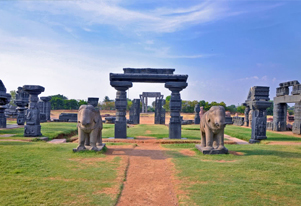 Thereafter, we will embark on the local sightseeing tour of Warangal. In our day tour, we will pay a visit to Ramappa Temple also known as the Ramalingeswara temple. Further, we will be visiting Thousand Pillared Temple. It is located in Hanamkonda is one of the most important parts of the Warangal City and is dedicated to Shiva, Vishnu and Surya. Afterwards, we will head towards Warangal Fort which was once the capital of the Kakatiya dynasty. Thereafter, we will head toward Pakhal Lake which is a man-made lake in the Pakhal Wildlife Sanctuary in Warangal district. Once can witness tiger, bear, leopard, etc. in the sanctuary and have a lifetime experience. Later, we will return back to our hotel for a comfy overnight stay. Today after breakfast in the morning, we will drive to Vijaywada. On reaching, check in at the pre-booked hotel and rest for a while. After having lunch in the hotel premises, the rest of the day is free at leisure. During your free time, you can either stay back in the hotel and take pleasure of its modern amenities or go out for a leisure walk to explore the beautiful surroundings. Enjoy an overnight stay in the hotel in Vijaywada. We will leave for Vijaywad's local sightseeing tour today after breakfast in the morning. Our today's day tour will start with a visit to the well known Durga temple. It is one of the famous Hindu temples dedicated to Goddess Durga. After offering prayers in the temple, we will head towards Amravati. Here, one can witness the medieval ruins of Buddhist temples and stupas. Thereafter, we will return back to the hotel in Vijaywada for a stress free overnight stay. After breakfast in the morning, we will check out from the hotel in Vijaywada and drive to Visakhapatnam. On arrival, check in at the already booked hotel and rest for some time. Later in the evening, go out for a leisurely walk at the beach and spend some quality time. An overnight stay in the hotel in Vishakapatnam. On the last day of our tour, we will start our day a bit early in the morning to take a short tour to Vishakhapatnam and witness its beautiful surroundings. Afterwards, get direct transfer to the airport to board flight for Delhi. On reaching Delhi, get direct transfer to Delhi international airport to board flight for onward destination.